The beautiful folds remind me of a Chinese fan. It was hard to resist.....and I was a-l-o-n-e. I admit to picking one up and doing the little fan dance. Shhh..let this be a secret between you and me. Bah! This is the 'internet' I am confiding on. 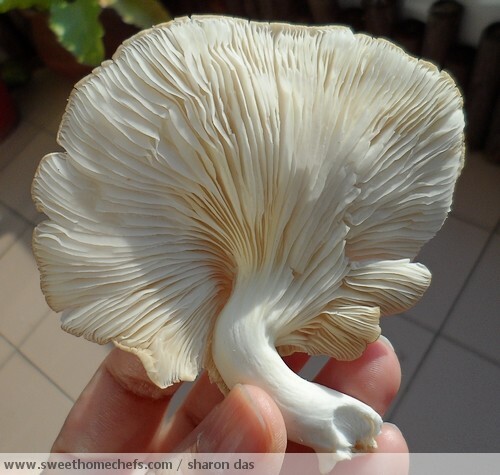 Grey Oyster Mushrooms are soft, velvety and cool on the fingers. I love the texture. It is easy to bite into and it has this lovely taste of mild sweet. 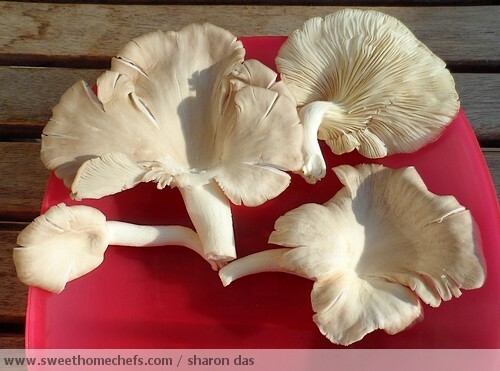 This mushroom is a versatile ingredient. Be it deep-fried, added into soups, braised or grilled, it tastes just as mmm..mmm..good. Personally, I find the stems a little chewy for soups and braised dishes so I tend to trim it off for later, usually to make stock. It is not always necessary to do this. I just like doing it because I'm biased towards the fluffy part - it is yummy! 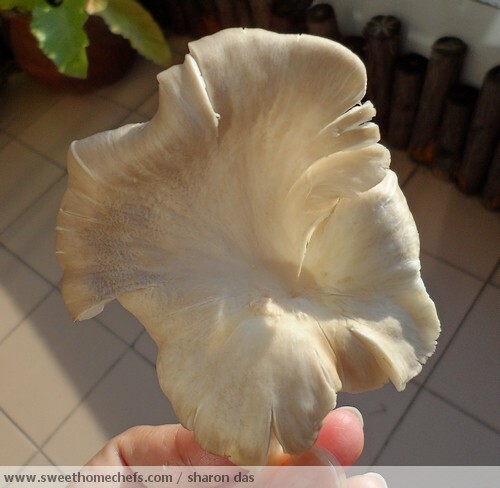 It takes only minutes to cook oyster mushrooms. Ideally, add it in only at the last stage of cooking. Storage: It stays good in a plastic bag for a week or so in the refrigerator. I've never kept it longer. I have however read that you can store it for up to two weeks wrapped in a moist napkin or towel, sealed in a paper bag. Buying: If it's slimy, don't buy it. Choose plump ones. Washing: Wash only before use. Swish it in water and that's all there is to it. Here's one way you can enjoy these mushrooms. I had this at a food truck in Johor. The mushrooms are deep-fried and then sprinkled with a seasoning of salt, sugar and pepper ..at least, that's what I'm guessing is in the powdery substance. Whatever it is, yum stuff! Okay.. now I gotta go buy me some Oyster Mushroom!!! They look delicious, Sharon. Would they go well in a salad, without being cooked? Wow, I've never had it fried!! Great tips, Sharon! Thanks, Shirley. This was the first time I had it fried. It was really delicious - I'm devastated I couldn't find a food truck that sold the same in Kuala Lumpur, where I live. Beautiful specimens. 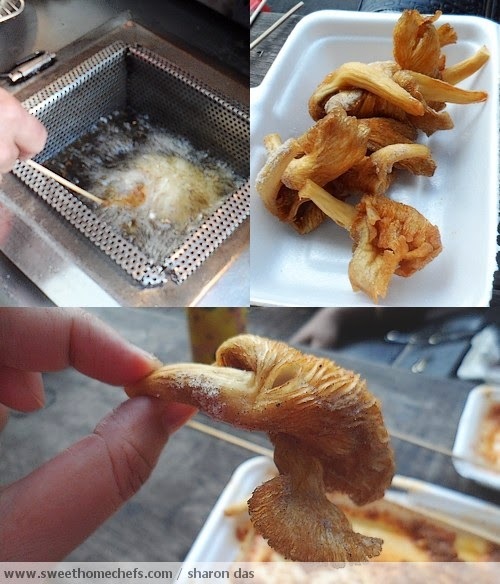 I've never deep fried a mushroom before. Not without a coating like batter or breadcrumbs. Do the mushrooms absorb a lot of oil?